VIDEO INTERVIEWS: Two Atlee Football Players Make College Commitments! Congratulations to kicker Ryan Molin and linebacker Isiah Stroble for making their college football, and academic commitments this morning at a ceremony at Atlee High School! HCS Media Network sat down with both players. CLICK HERE for our talk with Molin, who signed with Jacksonville University of the Pioneer Football League of the FCS! CLICK HERE for our conversation with Stroble, who will stay in-state in the ODAC with the Shenandoah Hornets! LACROSSE: Atlee Boys AND Girls Play Fauquier...Directions HERE! It's a first round "South Zone" Tournament match ("Zone" essentially meaning "Regional") as the Atlee Raiders boys lacrosse team travels to Warrenton to face Fauquier County on Friday at 7pm. The girls team will also face Fauquier at 5:30pm. Directions to the school from Atlee are FOUND HERE! The expected stormy weather arrived first at Hanover High School, where Semifinal Wednesday barely began, then eventually arrived at Deep Run, where action was suspended due to a major electrical storm. Except for a half-inning of softball, there was no action at the Conference 20 Jubilee at Hanover, as storms descended upon the area just before the 5pm start time. Over at Deep Run, only one game lasted long enough to become official, while two others were suspended as storms jammed pack with torrential rain and tremendous lightning overcame the West End. NOTE: ALL Conference 11 Championship games are moved to Friday, May 30th. Girls Soccer at 5:30, Boys Soccer (Mills Godwin/Douglas Freeman) at 7:30. Baseball and Softball start times TBA. NOTE: All Championship games remain originally scheduled for Friday, May 30th at Hanover High School. No changes made to the final round. 2014 All-Richmond Group Lacrosse Teams! These student-athletes were honored between the two championship games Tuesday night at Randolph-Macon College. Susie Glymph, Sarah Buckley, Savanah Dicken, Atlee; Pate Richardson, Mackenzie Flickinger, Vicky Lowry, Deep Run; Taylor Harmon, Gracie Douglass, Carly Craddock, Karoline Nease, Alyssa Hahn, Douglas Freeman; Tristen Slamowitz, Alyson Johnson, Caroline Smith, Kestyn Baughn, Emily Benko, Glen Allen; Michele Knizner, Laura Blunt, Hanover; Anna Gray, Zoe Sheppard, Hermitage; Abbey Myers, Kaitlyn Harrison, Christa Hill, Lee-Davis. Another shutout performance by Candace Whittemore, coupled with great defense and timely hitting, gave Patrick Henry the inaugural Conference 16 softball championship today, 4-0 over Halifax County. The Patriots improve to 15-1 overall, winning their fifth straight district or conference title dating back to 2010. Patrick Henry earns a bye to the quarterfinals of the 5A North Regional Tournament and will host a game next Monday. Click HERE to watch an exclusive video interview with Ashley Samuels, Candace Whittemore and Grayson Radcliffe about the Patriots win! Here are the brackets for Conference 11 Boys and Girls Soccer. Quarterfinals are Memorial Day! Lacrosse Results From First Round Action! GIRLS: #2 Atlee 18, #7 Lee-Davis 1; #4 Hanover 14, #5 Mills Godwin 6. In boys play, Atlee and Hanover will meet for the third time this season in the Group semifinals, while in girls action, Atlee will meet Deep Run, who defeated Glen Allen tonight, while Hanover gets the winner of Hermitage/Douglas Freeman, which was postponed until Friday at 6pm due to tonight's storms. BASEBALL: Hanover hands Douglas Freeman its first loss after an 18-0 start, defeating the Rebels in the West End 6-3 Wednesday night. Derek Casey won the pitching showdown as the Hawks improved to 14-2. Meanwhile, Mills Godwin handed Patrick Henry their second loss in 24 hours, beating the Patriots 7-0. SOFTBALL: Patrick Henry avenged their only loss of the season, beating Mills Godwin at their Senior Night 1-0, the same score whereby the Eagles beat the Patriots in Ashland April 10th. In both games, a late inning solo home run was the difference. Tonight it was Ashley Samuels leaving the yard on the left field wall in the sixth inning. Candace Whittemore struck out 12 Godwin batters in the victory. Patrick Henry faces Albemarle in the Conference 16 Semifinals Friday, 6pm in Ashland. Atlee, meanwhile, shut out Henrico 20-0 to move a win away from the Conference 11 crown and the top seed in next week's tournament. Atlee travels to Highland Springs Thursday for their finale. GIRLS SOCCER: Atlee is unbeaten no more. Taylor Guy had a hat trick as Mills Godwin erased an early 1-0 deficit and pulled away in the second half to a 3-1 victory. The Eagles are 13-1-1, the Raiders 12-1, but the Raiders still own the top seed at this hour on power ratings. NOTE: All Conference 11 Tournaments in baseball, softball and soccer BEGIN on Monday, Memorial Day, May 26th. 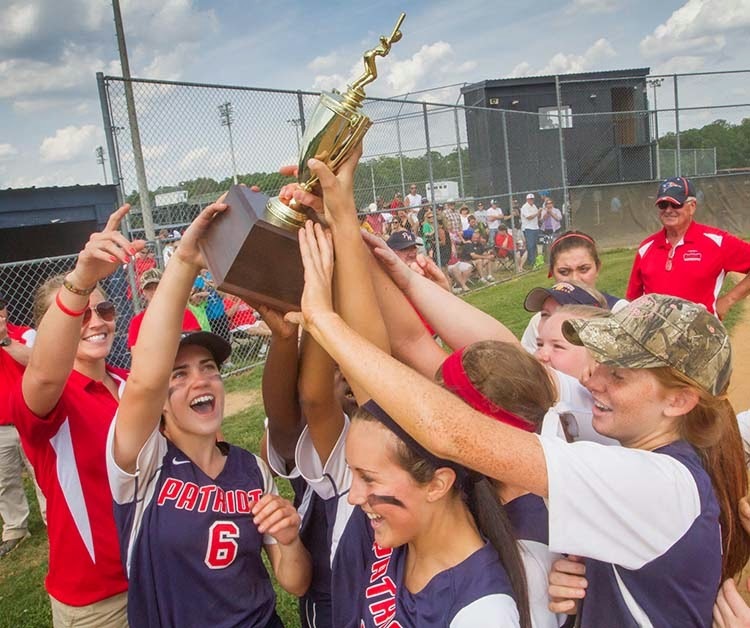 The Patrick Henry Patriots clinched the first-ever Conference 16 Softball regular season title tonight, defeating Hermitage 5-0 to improve to 12-1. Even if they lose at Mills Godwin Wednesday night in their season finale, PH has earned the top seed in the Conference 16 Tournament beginning Friday, and should host fourth-seeded Albemarle for the right to play for the conference title and clinch a 5A North Region berth. In the battle for first place in Conference 11, Atlee held off Lee-Davis 3-1 Tuesday night to improve to 12-4, overtaking the Confederates, whose season ends at 13-5 for the top spot. The Raiders host Henrico Wednesday and go to Highland Springs Thursday. Two wins will clinch the number one seed in next week's inaugural conference tourney. Peyton St. George struck out seven as the Raiders scored two runs in the first inning and an insurance run in the fourth. Kylie Stonebreaker pitched for the Confederates, as Lauren McIntyre was moved to shortstop to replace Jordan Trimiew, injured in practice on Monday, also striking out seven batters. A Patrick Henry win over Mills Godwin will likely earn Lee-Davis the number two seed in Conference 11. If they finish tied for second, Lee-Davis does hold a head-to-head tiebreaker edge, if that comes into play. Lee-Davis boys soccer knocked off homestanding Atlee 1-0 in overtime to improve to 10-4, second place in Conference 11. The Raiders fell to 8-4-2. In girls soccer action, Atlee remained unbeaten at 12-0 with a 6-0 shutout of Lee-Davis, who fell to 7-5-1. This sets up a showdown for the Raiders at Conference 11 foe Mills Godwin (12-1-1) tomorrow night, essentially for the top seed in next week's tournament and the regular season title. BASEBALL: Lee-Davis improved to 12-5 with a 5-1 victory at home over Atlee (6-10). Patrick Henry was upset at Hermitage 6-5 in 8 innings. The loss may have cost the Patriots a home game in the Conference 16 semifinals this Friday. If they are the third seed, they'll have to travel to the second seeded team. Hanover disposed of Highland Springs 14-0 and next go to undefeated Douglas Freeman tomorrow night in a rematch of the 2013 Central Region Championship game, won by the Rebels. The Hawks, however, eventually won the Group AAA State Championship. TENNIS: Danny Polk and James Pollard each won Conference 20 Boys Semfinals to set up a Hanover vs. Hanover conference championship match, which will take place on Thursday. Lee-Davis' Blake Rush Signs To Play College Wheelchair Basketball! A triumphant day at Lee-Davis High School as Blake Rush signs his letter of intent to play collegiate wheelchair basketball, a sport offered by just eight universities, at Edinboro University in Pennsylvania! On our YouTube Channel, Blake talks about his time as a Lee-Davis student, his decision to go to Edinboro, his Olympic hopes, and more, as he is joined by his parents, Kevin and Donna. CLICK HERE to watch HCS Media Network's interview with Blake Rush! It was a good night for Hanover High School. Both the girls and boys lacrosse teams finished their regular season with victories at rival Lee-Davis, the women by a 13-5 score, the men with a 13-7 victory. Kara Kane scored five goals in the girls victory, while the boys went on a 9-0 run in the first half to take a commanding 10-1 halftime advantage. It is likely the Hanover boys, the #3 seed in the Richmond Group of the first-ever VHSL Lacrosse Championship Tournament for 1A-5A schools, will face Lee-Davis again in the quarterfinals on Thursday. Hanover would host. Hanover girls lacrosse finishes as the #4 seed and could host either Mills Godwin or Glen Allen. Tournament brackets should be released sometime tomorrow. SOFTBALL: Hanover improved to 11-2 with a 9-1 Conference 20 victory over J.R. Tucker. The Hawks are the #1 seed for next week's conference tournament, getting a first round bye. They have two games remaining in the regular season. Atlee shut out Highland Springs 22-0 to move to 11-4, #2 behind Lee-Davis (13-4) in Conference 11 standings as the teams prepare for their showdown tomorrow night (heard LIVE on HCS Media Network at 6:50pm ET here at HanoverCountySports.net). Lee-Davis currently has 5.35 points, Atlee has 5.13. Tomorrow night's winner has the inside track on the Conference 11 regular season title. Mills Godwin lurks just behind at 12-5 (5.00). PLAYOFF NOTE: As of tonight, Patrick Henry is still #1 in Conference 16 at 6.416 points. Halifax County has finished its regular season at 16-4 (5.600 points), Orange County is done at 14-5 (5.158 points). Patrick Henry needs a win in its final two games, either tomorrow at Hermitage or Wednesday at Mills Godwin (LIVE on HCS Media Network) to clinch the Conference 16 regular season title and the #1 seed in Friday's semifinals. The top seed would play #4 Albemarle, the only team in the Conference with a losing record. BASEBALL: Lee-Davis settled into the #3 seed for next week's Conference 11 Tournament with a 7-0 shutout of Henrico. The Confederates are now 11-5. Atlee defeated Highland Springs 7-2 and improves to 6-9, still two wins behind 4th place Deep Run (8-9). Atlee finishes at Lee-Davis tomorrow and at Highland Springs on Thursday night. SOCCER: Patrick Henry fell twice tonight, as the boys lost at Mills Godwin 3-1 while the girls were shut out at home by the Eagles 3-0. Atlee boys soccer took a 3-1 victory over Highland Springs to improve to 8-3-2 and in a battle for second place behind Godwin in Conference 11 with Lee-Davis, whom they travel to meet tomorrow night. PLAYOFF NOTE: The Lee-Davis at Atlee boys soccer match tomorrow night will help determine the second and third seed in Conference 11. Atlee is 8-3-2, Lee-Davis is 9-4. The Confederates enter the game in second place with 4.846 points, the Raiders third at 4.308 points. An Atlee win creates a tie for second with a game to go for both teams. It would also give Atlee the 2-0 regular season sweep of Lee-Davis. No word on whether head-to-head would help break a tie in Conference 11. A Lee-Davis win would clinch the #2 seed in next week's tournament. The softball games between Lee-Davis and Varina WILL be played on their ORIGINAL schedule this evening. The JV game is at L-D at 6pm, the Varsity game is at Varina starting at 7pm! Varsity Boys and JV Girls play their matches at 7pm. These two teams may be on a collision course for the early rounds of the 5A South Region, but first have work to do in their respective conferences. The Raiders and Lancers begin today at 4:30, trying to beat the storm. LIVE tweet coverage available exclusively at @hanoversports !! If we can hold the rain, thunder and lightning at bay, maybe we can get in what promises to be an excellent lacrosse match tonight, as the 5-4 James River Rapids come to Hanover to battle the 5-4 Hawks! 2) Bookmark our Mobile Link to listen to ALL HCS Media Network broadcasts on your smartphone or tablet!! Do that by CLICKING HERE! Rob Witham will be on the call tonight live at Hanover High School as our homestretch coverage of the 2014 spring seasons continues!! VIDEO INTERVIEW: Lee-Davis' Volleyball Standout Brooke Bowman Talks Guilford College! Soon she'll be a Quaker! At a ceremony Monday honoring Brooke Bowman's commitment to play college volleyball in the ODAC at Guilford College, Brooke paused to talk with HCS Media Network for a few moments about her decision, her past, and what she'll miss most about her time as a Lee-Davis Confederate! Watch her video interview on our YouTube Channel by CLICKING HERE! Atlee softball has righted the ship. This time the bats came through early as the Raiders sailed to their fourth win in seven days, turning a 3-3 start and lots of uncertainty into a 7-3 record and tons of momentum with a 7-3 victory. Lee-Davis falls to 10-4 and gets Henrico Friday before getting ready for a rematch with Hanover at home Tuesday night. In other action, Lee-Davis shut out Atlee in baseball 12-0. In boys soccer, Atlee nipped Lee-Davis 2-1 in overtime, while Hanover shut out Varina 3-0. In girls lacrosse, Lee-Davis nipped Patrick Henry 9-8, while Hanover shut out Hermitage 16-0. The Atlee boys snapped a two-game losing streak with a 16-1 win over Lee-Davis. JUST ADDED: HCS Media Network will provide LIVE coverage of Lee-Davis at Patrick Henry Boys Lacrosse on Saturday at 9:50AM ET. Listen live by clicking on the Mixlr player at the top of our website or bookmark the link below for any mobile device! The link is good for ALL HCS Media Network broadcasts of live high school sports! GAMEDAY: LISTEN LIVE to Atlee vs. Glen Allen Softball!! Atlee softball is out for both momentum, and a bit of revenge, as they host Glen Allen tonight! Their 3-1 loss to the Jaguars earlier this season was their first loss to Glen Allen ever. But after knocking off previously unbeaten Hanover Friday to split their season series, and to improve to 4-3, the Raiders are looking to move onward and upward. LISTEN LIVE to tonight's game if you aren't able to join us at Atlee at 6:50PM ET by clicking on the big circle in the Mixlr Player above HERE on this webpage! Join Rob Witham for all the action LIVE as the Jaguars and Raiders collide one last time in 2014!